This system works by splitting light beams in two. In fact, all beam splitters of this size in use today are made from a type of foil. Light is directed through a beam splitter, which then appears in 3D space at a depth that we can control. This foil is a polymeric mirror with a specific formulation, thickness and oriented in a way to maximize holographic effect. These Holographic effect foils are made for rugged indoor/outdoor use and are resistant to rain, fire, sun, fog machines, laser light and foolish people with sharp objects. Once we understand what you are looking to accomplish, we can help guide you in the best size options. Our Extreme Definition Holographic Effect foils are of the highest quality, and clarity. The evident resolution that can be reflected is in excess of 16k and improvements are constantly being made. They are an excellent balance between strength, clarity and reflectivity. In addition, our foils can be tuned to deliver reflectivity selection. Inferior foils will cause you trouble, and adversely affect your show. Tension has been the subject of some debate. However, a tension system has been in the public domain for many years starting in the 50's with DuPont®, the in the early 90's with Disney, then later in that decade in Berlin, the Virtual Eye exhibit in 1997, Phantasialand Feng Ju Palace, and EXPO 2000. Depending on where your final installation will take place, you may be able to use this system freely. Just click on the inquiry tab to check with us. Our LRET (Linear RETention) advanced tension system is available to meet the needs of clients who want ultimate freedom and control, and is particularly useful with larger foil spans. The public domain tension although useful, has it's drawbacks for larger installations, and of those lasting extended periods of time. We are the only company in the world to offer SuperSpan foils up to 39 feet by infinite width. No other source can provide crystal ghost effects foils in these massive sizes. Our foils are inherently NFPA 701 & 702 Class 4 flame resistant. This means our foil can pass NFPA 701 standards without any additional treatment, and pass inspection by government agencies on every continent around the world, including the US. "Our innovative workarounds are in fact, a trade secret." Although this spectral illusion is known as Pepper’s Ghost, the technique was first developed by the British inventor, Henry Dircks (1806-1873). After working with magic lanterns in theater productions, a popular illusionary technique called phantasmagoria, he developed a new technique to make it seem as though a ghost was really on the stage, rather than in the background, as was the case with the magic lantern shows. Yet, he couldn’t quite figure out how to incorporate the trick into a theatre performance without requiring costly alterations to the theatre. It was a chemist from London’s Polytechnic Institute, John Henry Pepper (1821-1900), who came up with a simpler way of incorporating the illusion into a stage performance. In 1863, Pepper premiered this new technique in a production of Charles Dickens’ The Haunted Man, and from then on it was known as Pepper’s Ghost. Naturally, Dircks was none too happy about this title given to the illusion he had developed. 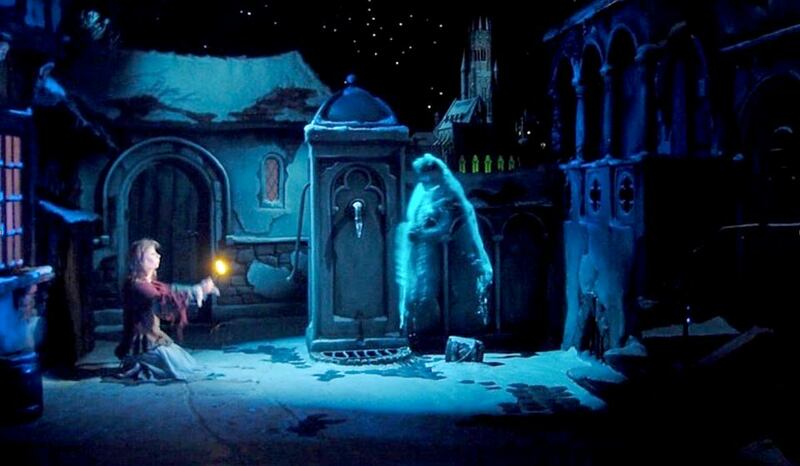 The apparition one sees in a Pepper’s Ghost illusion is the reflection of an object or figure hidden from view. A sheet of film is installed between the viewer and the room or stage in which the ghost will appear. This film is angled so that whatever it will reflect can be hidden from the audience in a secret room. The hidden room is an entirely black mirror-image of the stage where the actual “ghosts” are placed. When it is time to make the ghosts appear in front of the audience, the hidden figures are lit and their reflection appears in the glass. The figures in the mirror-image room will be arranged so that their reflection corresponds with where they should appear on stage. For example, if you wanted to make a ghost appear at a table, the room visible to the audience would already have a table and a chair in it. However, in the mirror-image room, a figure would be sitting on a black chair, or similar prop, positioned so that the reflection lines up with the table and chair in the main room. When a light is turned on the figure, it will appear as though a ghost is sitting at the table visible to the audience. We ship our foil materials in a sealed PVC tube. This tube is then placed into a custom sealed pallet for it's journey to you. Average weight is 100-250 kg. We've developed our own liquid solution for cleaning our polymeric foils. Cost is $89 per gallon for clients. Yes. It is sold in any width up to 39.5' wide x infinite length. We ship Mylar to every continent on earth via ship, vehicle, or airfreight.